The EU will give fresh impetus next month to Turkey's bid to join the 28-nation bloc by opening talks on economic policy, Turkey has announced. Turkey's new Europe Minister Volkan Bozkir said the EU had agreed to open a new chapter in stalled negotiations. Turkey's long-running dispute with EU member Cyprus, and the EU's concerns about human rights in Turkey have made progress in the talks extremely slow. But the EU wants to encourage Turkey to stem the flow of migrants to Europe. The whole idea of Turkey joining the EU is very controversial. Many European politicians, including German Chancellor Angela Merkel, are unenthusiastic. Such a large, mainly Muslim country with many rural poor could change the whole character of the EU, critics argue. Turkey's EU negotiations began in 2005, but so far only 13 chapters have been opened and only one - science and research - has been provisionally closed. Chapter 17 of the EU acquis - the rules that would-be members have to sign up to - covers economic and monetary policy. Mr Bozkir tweeted that Chapter 17 would be opened at talks on 14-15 December in Brussels. The European Commission has urged Turkey to strengthen democracy and human rights, underlining the need for deeper judicial reform. President Recep Tayyip Erdogan's crackdown on political opponents has drawn much criticism in the EU. Turkish Prime Minister Ahmet Davutoglu will visit Brussels on Sunday for a summit with EU leaders, focusing on the migration crisis. Turkey and the EU have agreed on an action plan, committing the EU to supporting Turkey financially and technically in its efforts to house refugees. 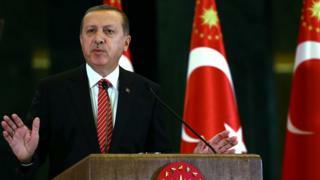 Turkey is sheltering more than two million Syrian refugees, and has spent more than €7bn (£5bn; $7.4bn) on that effort. The EU will provide Turkey with €3bn in January to help ease the refugees' plight. Thousands of Syrians and other migrants - including refugees from Iraq and Afghanistan - are still entering the EU via Greece every day. The EU is anxious to stop the exploitation of migrants by people traffickers in Turkey, who charge huge sums to pack them on to small, often unseaworthy boats sailing to nearby Greek islands. More than 650,000 have sailed to the islands from Turkey this year, risking their lives. Greece says it cannot cope with the influx - it is now getting help from the EU and aid workers, but the unprecedented numbers have caused tensions across the EU. Turkey argues that it is already shouldering much of the refugee burden, and that its security forces are fully stretched dealing with the crisis on its border with war-torn Syria. Meanwhile, Turkey is urging the EU to ease the visa rules for Turks travelling to the EU. Visa liberalisation is an important part of the accession process for any country hoping to join the bloc.